Proto Whey® Protein Blend (Micro Peptides™ from High-DH Hydrolyzed Whey Protein [40% Di and Tripeptides], Whey Protein Isolate, Whey Protein Concentrate), Palm, and Kernel Oils, Organic Tapioca Syrup, Sugar, Chicory Root Fiber, Cocoa Processed With Alkali, Tapioca Starch, Chocolate Liquor, Natural Flavors, High Oleic-Sunflower Oil, Fructose, Soy Lecithin, Salt, Calcium Carbonate, Stevia Leaf Extract, Dextrose, Lactose. Proto Whey Proprietary Protein Blend (Proto Whey® [Micro Peptides From Extreme Hydrolyzed Whey Protein Fraction [40% Di & Tri Peptides], Whey Protein Isolate, Milk Protein Isolate), Palm Oil, Enriched Flour (Wheat Flour, Malted Barley Flour, Niacin, Reduced Iron, Thiamine Mononitrate, Riboflavin, Folic Acid), Sugar, Palm Kernel Oil, Cocoa Processed With Alkali, Canola Oil, Fructose, Natural Flavors, Soy Lecithin, Salt, Baking Soda, Ammonium Bicarbonate, Stevia Leaf Extract. Contains milk, soy (from lecithin). This product is manufactured on equipment that also processes peanuts, tree nuts, egg, wheat. Proto Whey Protein Blend (Micro Peptides from High-DH Hydrolyzed Whey Protein [40% Di and Tripeptides], Whey Protein Isolate, Whey Protein Concentrate), Palm and Palm Kernel Oils, Organic Tapioca Syrup, Sugar, Chicory Root Fiber, Cocoa Processed with Alkali, Tapioca Starch, Chocolate Liquor, Natural Flavors, High Oleic Sunflower Oil, Fructose, Soy Lecithin, Salt, Calcium Carbonate, Stevia Leaf Extract, Dextrose, Lactose. Proto Whey® protein blend (Micro Peptides™ from High-DH hydrolyzed whey protein [40% di and tripeptides], whey protein isolate, milk protein isolate), palm oil, enriched flour (wheat flour, malted barley flour, niacin, reduced iron, thiamine mononitrate, riboflavin, folic acid), palm kernel oil, sugar, canola oil, cocoa processed with alkali, fructose, natural flavors, soy lecithin, maltodextrin, salt, stevia leaf extract, baking soda, ammonium bicarbonate, monk fruit. milk, wheat, soy (from lecithin). This proudct is manufactured on equipment that also processes peanuts. Proto whey® protein blend (micro peptides™ from high-DH hydrolyzed whey protein [40% di and tripeptides], whey protein isolate, milk protein isolate), palm oil, enriched flour (wheat flour, malted barley flour, niacin, reduced iron, thiamine mononitrate, riboflavin, folic acid), sugar, palm kernel oil, canola oil, dextrose, soy lecithin, natural flavors, sucralose, baking soda, salt, ammonium bicarbonate, stevia leaf extract. Serving Size: 1 Cookie (40g) 1.4 oz. Proto Whey® Protein Blend [Proto Whey (micro peptides from extreme hydrolyzed whey protein [40% di & tripeptides), maltodextrin], whey protein isolate, milk protein isolate), palm oil, enriched flour (wheat flour, malted barley flour, niacin, reduced iron, thiamine mononitrate, riboflavin, folic acid), sugar, palm kernel oil, canola oil, fructose, natural flavors, soy lecithin, corn fiber, carotenes (natural color), lemon oil, citric acid, salt, stevia leaf extract, monk fruit, baking soda, lactic acid ammonium bicarbonate. Contains milk, wheat, soy (from lecithin). This product is manufactured on equipment that also processes peanuts. Proto Whey® protein blend (Micro Peptides™ from High-DH hydrolyzed whey protein [40% di and tripeptides], whey protein isolate, milk protein isolate), palm oil, enriched flour (wheat flour, malted barley flour, niacin, reduced iron, thiamine mononitrate, riboflavin, folic acid), palm kernel oil, sugar, cocoa processed with alkali, canola oil, fructose, natural flavors, decaffeinated coffee concentrate, maltodextrin, soy lecithin, salt, stevia leaf extract, baking soda, ammonium bicarbonate, monk fruit. Proto Whey® protein blend (Micro Peptides from High-DH hydrolyzed whey protein [40% di and tripeptides], whey protein isolate, milk protein isolate), palm oil, sugar, palm kernel oil, enriched flour (wheat flour, malted barley flour, niacin, reduced iron, thiamine mononitrate, riboflavin, folic acid), fructose, canola oil, cocoa processed with alkali, coconut oil, chicory root fiber, trehalose, soy lecithin, natural flavors, natural colors, milkfat, maltodextrin, stevia leaf extract, carmine (natural color), baking soda, ammonium bicarbonate, salt, monk fruit. Proto Whey® Protein Blend (Micro Peptides™ from High-DH Hydrolyzed Whey Protein [40% Di and Tripeptides], Whey Protein Isolate, Milk Protein Isolate), Palm Oil, Enriched Flour (Wheat Flour, Malted Barley Flour, Niacin, Reduced Iron, Thiamine Mononitrate, Riboflavin, Folic Acid), Sugar, Canola Oil, Dextrose, Natural Flavors, Soy Lecithin, Annatto, Sea Salt, Sucralose, Cocoa Processed With Alkali, Baking Soda, Ammonium Bicarbonate, Stevia Leaf Extract. Proto whey® protein blend (micro peptides™ from high-DH hydrolyzed whey protein [40% di and tripeptides], whey protein isolate, milk protein isolate), palm oil, enriched flour (wheat flour, malted barley flour, niacin, reduced iron, thiamine mononitrate, riboflavin, folic acid), palm kernel oil, sugar, cocoa processed with alkali, canola oil, fructose, soy lecithin, natural flavors, maltodextrin, salt, stevia leaf extract, baking soda, ammonium bicarbonate, monk fruit. Apr 14, 2017 Power Crunch Bars: Affordable, Tasty, and No Fake Fiber! Protein – likely the most misunderstood nutrient in our diet and the most complex to digest. And yet most consumers today have become aware of the need for healthy amounts of protein as a part of their daily routine. But gram for gram, all proteins do not deliver the same nutritional value. 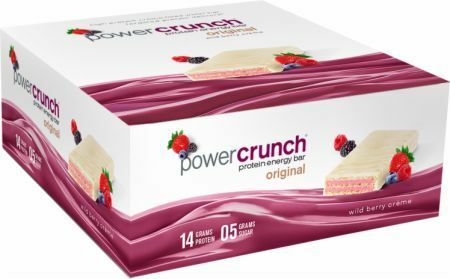 Power Crunch Original Protein Energy bars are a breakthrough in the evolution of smart food. Introduced as our first protein bar line, the Power Crunch Original protein bar is still the only wafer crème style protein bar on the market. The unique cookie inside packs the ideal amount of protein while bringing out the true meaning of the word “Crunch,” in a deliciously enticing snack, scientifically designed to power your busy lifestyle.